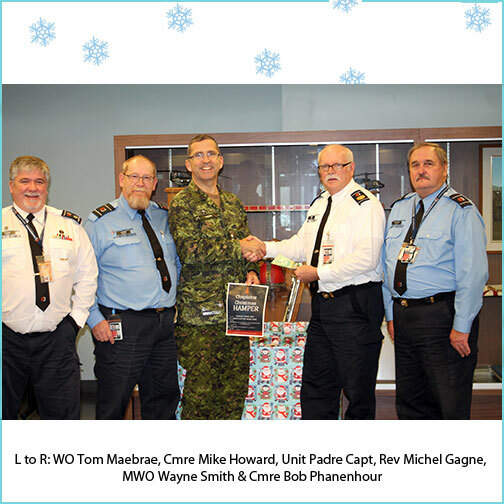 Petawawa commissionaires at Section 73 band together once again this year to fund Christmas hampers for deserving local families this holiday season. For over 25 years, the Christmas Hamper Fund at Garrison Petawawa has helped bring smiles to local children and families in need. This year, our commissioners at Section 73 rallied to raise a total of $147.00, which will be used to assemble Christmas hampers containing gift cards for groceries, a pair of pajamas and an age-appropriate toy for each child. Last year, the generous donations of units within 2 CMBG, 4 CDSG, as well as all Lodger units resulted in delivering, 105 hampers to military families and toys to over 250 children. Volunteers hope to meet or exceed that amount this year. The success of a large initiative such as this depends on the hard work and dedication of many volunteers. The 2016 Christmas Hamper campaign is dedicated in memory of Mrs. Frankie Jane Giller, long-time contributor and organizer. We proudly recognize and thank Section 73 and everyone else involved for their continued commitment to helping to bring smiles to people’s faces this holiday season.